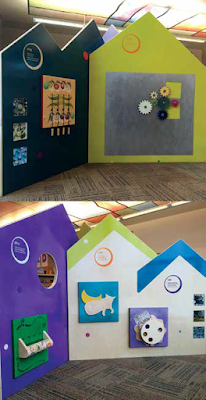 Young visitors and their grown-ups can do a lot more than read in the Children’s Area at Sherwood Public Library now, thanks to a interactive “kiosk” with a variety of objects to twirl, move and manipulate. Playful options include a caterpillar matching game, a “Wheels on the Bus” driver’s view, color-mixing wheel, story station, magnetic gears, word and picture magnets, and puppet “peek-aboo” window. Messages for grown-ups give gentle nudges to let children explore and learn. The result has turned the Library into a destination for families. The kiosk was funded by a Community Enhancement Project grant for $10,605 through Metro and City of Sherwood. Burgeon Group, the creator of the kiosk, is a Portland-based firm with the philosophy that “kids learn through play”. The kiosk is built with durable and ecological materials, and designed so pieces can be traded out to keep the content fresh.